As the National Geographic Traveler has noted, Barcelona is best absorbed by “dancing slowly with her, like an elusive mistress. You have to seduce her to find her secrets.” Layers of architectural wonders, formidable cuisine, and a buzzing nightlife are all part of the territory when visiting Barcelona—but the seven golden-sand beaches that rim its Mediterranean coastline often come as a surprise. Sun and sand. This is not exactly the first set of images that normally come to mind when one considers the Barcelona hotel scene. 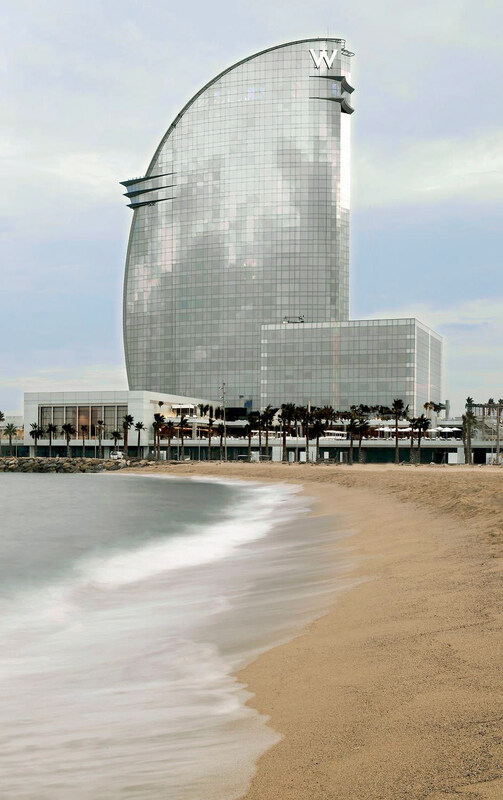 And yet, the W Barcelona—a sail-shaped glass-and-steel tower designed by Spanish architect Ricardo Bofill—is a 26-storey tribute to the Mediterranean and stands glinting above the city’s port, at the southernmost tip of the Barceloneta beachfront promenade. The W Barcelona embraces the sun with full-length windows, and the rooms are what one expects from W: stylish and fun with spa-like bathrooms. An extended chaise loungue that spans the length of the windows makes for a cozy, pillow-strewn perch from which to soak up the panorama. And when you leave the room, you won’t have to go far to find the action. The vibrant W lounge and Eclipse rooftop bar are playgrounds for grown-ups. Drinks range from traditional to the eclectic—which is similar to the clientele, making people-watching a spectator sport. The hotel’s Bravo 24 restaurant is run by a Ferran Adrià protégé, chef Carles Abellán of the Michelin-starred Comerç 24, while lighter, small-plate meals are served at the casual Wave restaurant. Add the pool overlooking the beach and a fully equipped Sweat Fitness Centre and Bliss Spa, and the W Barcelona is an architectural statement that inspires wide-eyed stares.